KICP's Big Bang & Beyond Becomes An Adult Education Course. For the past three years the KICP has offered very successful, intensive, three day, cosmology, short courses for planetarium staff. These courses have a very direct impact on how modern cosmology is incorporated into public programming. Another innovation is to take the essence of each course and to craft it into a three part Adler adult education program. See Adler Education The Big Bang and Beyond will be presented in three parts at the Adler Planetarium & Astronomy Museum in the Star Rider Theater on Wednesday's from 7:00-8:30 p.m. 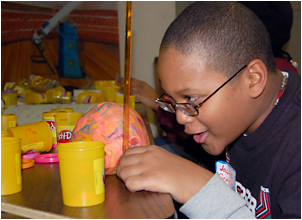 The theme of YSI 2006 was "Sink or Swim: Exploring Buoyancy & Density". Twenty-four (24) Space Explorers, thirteen (13) instructors and fifty (50) parents and siblings participated in this week long, residential, immersion experience. The institute was conceptually linked to the 2005-06 Saturday laboratory sessions, which explored pressure, especially air pressure. 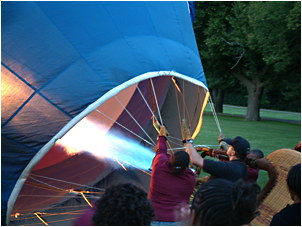 A memorable highlight of the institute was the in inflation and tethered launches of an actual 77,500 cubic foot hot air balloon. Daytime laboratories examined how density can be used to separate plastics for recycling, convection and how it results from changes in density caused by heating, and a qualitative investigation into what creates lift for a balloon. Nighttime activities included utilizing the observatory telescopes to examine dying stars, aka spectra of planetary nebulae and an exploration of the density of the moon to debunk the myth that it is made out of cheese. Instructors: Matt Bayliss, Mary Beard, Charles Brass, Kyle Cudworth, Bill Fisher, Robert Friedman, Walter Glogowski, Sarah Hansen, Vivian Hoette, Rich Kron, Randy Landsberg, Dan Robertson, Chaz Shapiro, Reid Sherman, Phil Wisecup. The Auger North Design Workshop will focus on the optimal design for the Northern site of the Pierre Auger Observatory. 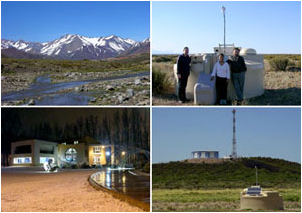 The imminent completion of the Southern site of the Pierre Auger Observatory in Argentina will mark the beginning of a new era in Particle AstroPhysics. After 2 years of operations, the Southern site will increase by one order of magnitude the worldwide exposure to the highest energies particles and should begin to unveil the long standing mystery of the origin of the ultra-high energy cosmic rays. It is time to design the Northern site of the Auger Observatory to meet the challenge of CHARGED PARTICLE ASTRONOMY. The energy range between 1019 eV and 1020 eV is of particular importance as it provides a window to point back to the sites where such fantastically high-energy particles originate. The Auger North Design workshop will coordinate the present international R&D effort to design the most effective Northern site Observatory. The present plan calls for a much larger array with wider spacing to fully explore the ability to point back to possible sources. James W. Cronin, KICP senior member. Celebration of James W. Cronin's 75th Birthday. While working at Brookhaven National Laboratory in 1964, Cronin and Fitch, both then at Princeton, observed the first example of nature's preference for matter over antimatter. Without this phenomenon, which physicists technically refer to as charge-parity violation, no matter would exist in the universe anywhere. High-energy cosmic rays consist of protons and other subatomic scraps of matter that fly through the universe at nearly the speed of light. The most powerful cosmic rays contain more than a hundred million times more energy than the particles produced in the world's most powerful particle accelerator. When these rays collide with air molecules in Earth's atmosphere, they trigger a shower that multiplies into billions of secondary particles before they reach the ground. The project developed from a 1992 suggestion of Cronin and Alan Watson of the University of Leeds. The project broke ground in 1999, and made its first detection of high-energy particles from space in 2001. More than half the observatory's 1,600 detectors are now collecting data. 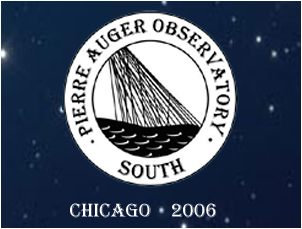 The Auger South Analysis Meeting will take place at the Gleacher Center in downtown Chicago, from September 11th to the 14th, 2006. 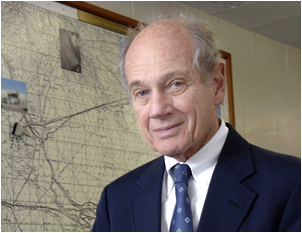 The Analysis Meeting will follow a two-day celebration of James W. Cronin's 75th Birthday Celebration on September 8th and 9th. Smaller meetings are being planned by sub-groups for the 10th of September. The unifying theme of 2006 KICP Yerkes Winter Institute was scale. This theme built directly upon the autumn quarter Saturday laboratory sessions, which focused on the methods by which distance is measured in astronomy. Twenty-six (26) Space Explorers, four (4) Returning Scholars (i.e., former Space Explorers helping during their college break) and nine (9) laboratory instructors participated in YWI 2006. The day laboratories explored the power of scale models for astronomical distances. "Seasonal Myth Busters" examined distances in the Earth-Sun-Moon system and the phases of the moon with the aid of a mechanical clockwork model, an orrery, and a kinesthetic exercise. "Planets: How Big? How Far?" gave the students a real sense of the dramatic scales and distances within the solar system. It explored the volumes of, and distances to, the planets using scale models that the students constructed out of Play-dough. "Milky Way Model" involved a construction project of massive proportions, billions of stars and hundreds of light-years in size. In the 90-foot dome, the students created a model of the Milky Way galaxy which provided valuable insights into polar coordinates and a deeper understanding of the astronomical information contained in the data (e.g., composition and nature of matter in the galaxy, the optical obstruction caused by cold, dense Molecular Clouds, and the necessity of making astronomical observations at many frequencies). Evening activities extended the concept of scale. Students took a digital tour of the universe that featured SDSS data. They observed the moon with the 24-inch telescope and binoculars and determined the size of key features such as the sea of tranquility. Finally, on a night with poor weather, they viewed the classic "Powers of Ten" movie. With financial support from the Office of the Vice President for Research and with the support of the Dean of the Humanities Division, a new written and verbal communication component was added. This effort sought to improve communication skills by developing reading, writing and oral exercises, which are complimentary and connected to the student scientific investigations. This component was lead by an anthropology graduate student, who met with the students on campus after Saturday Labs and who also integrated writing activities into the 2007 Yerkes Summer Institute with pre-institute readings and BIG Questions expository writing exercises.